…on this occasion I had a meeting and asked a student working with me to fetch us some coffees. She didn’t mind being the ‘tea girl’ but not being a fan of coffee or tea didn’t quite know where to go for them. I suggested Greggs as it was the nearest place to us in the city. 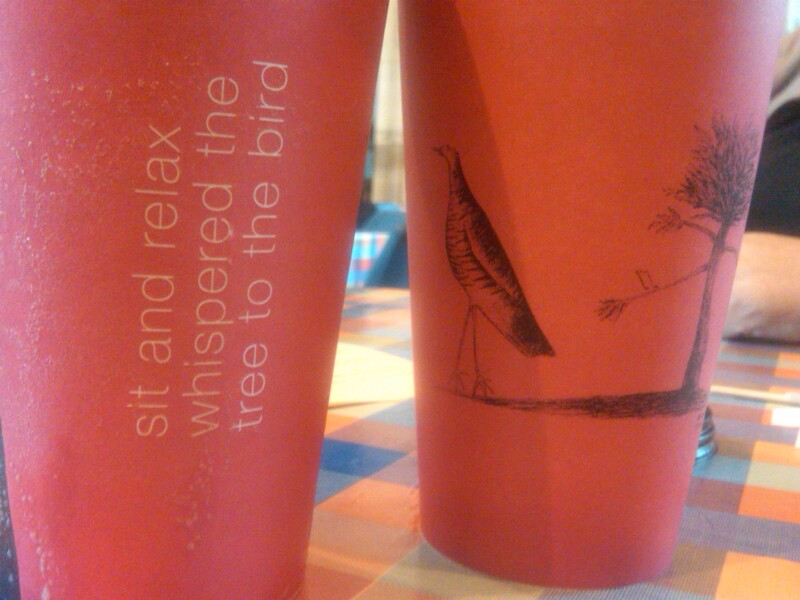 She came back with the coffee which had a beautiful picture and poem on it: ‘sit and relax whispered the tree to the bird.’ One of the guys I was meeting had heard God speak to him recently about dwelling and being. This coffee reminded him of that whisper. Is it our theology that’s wrong in that we don’t expect Him to speak in the “ordinary”? yes, I quite agree Steve… God speaks through the ordinary. For this guy I was meeting it was a powerful reminder of what he had felt God speak to him about. Of all the coffee shops in all of Peterborough the cups had a simple message, granted, not straight from the pages of the bible but non-the-less, it reminded him of John 15 and the dwelling that is required of us.